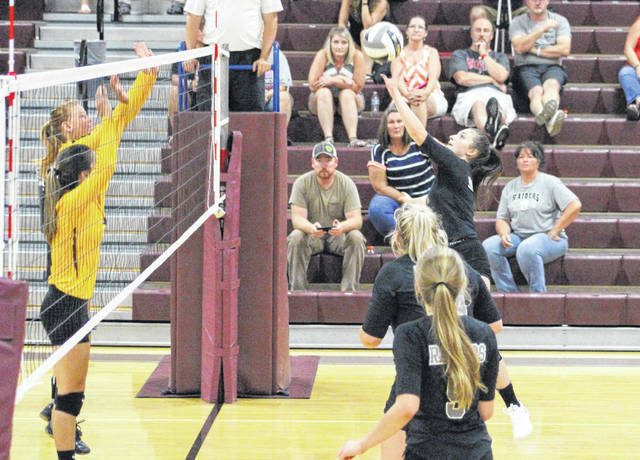 River Valley junior Jaden Bradley, right, hits a spike attempt at a pair of Meigs blockers during Game 4 of Tuesday night’s TVC Ohio volleyball opener at Larry R. Morrison Gymnasium in Rocksprings, Ohio. Meigs junior Maci Hood (6) leaps for a spike attempt during Game 4 of Tuesday night’s TVC Ohio volleyball opener against River Valley at Larry R. Morrison Gymnasium in Rocksprings, Ohio. ROCKSPRINGS, Ohio — It’s never over until it’s over. 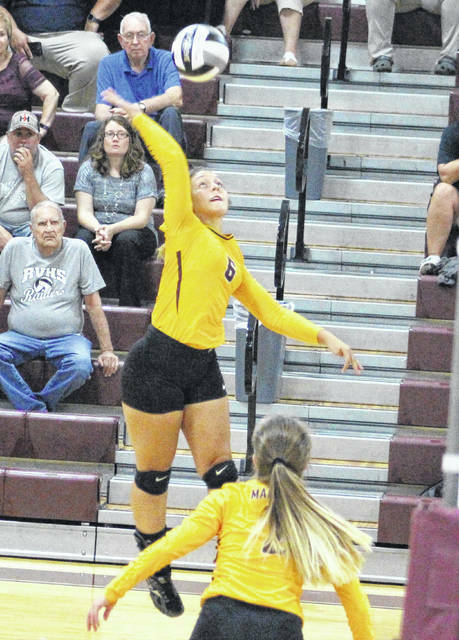 The River Valley volleyball team overcame match deficits of 1-0 and 2-1, then rallied back from a 7-2 hole in the decisive fifth game to claim an impressive 22-25, 25-19, 19-25, 25-12, 15-11 victory over host Meigs on Tuesday night in the Tri-Valley Conference Ohio Division opener for both programs at Larry R. Morrison Gymnasium. The visiting Lady Raiders (4-1, 1-0 TVC Ohio) notched their fourth consecutive triumph while also doubling last season’s win total in the process, but those achievements were anything but easy in obtaining. The guests let a 22-19 lead in Game 1 get away as the Lady Marauders (2-2, 0-1) answered with six straight points for a 1-0 match advantage, but the Silver and Black retaliated by breaking away from a 15-all tie with a 10-4 run that tied the match at one apiece. 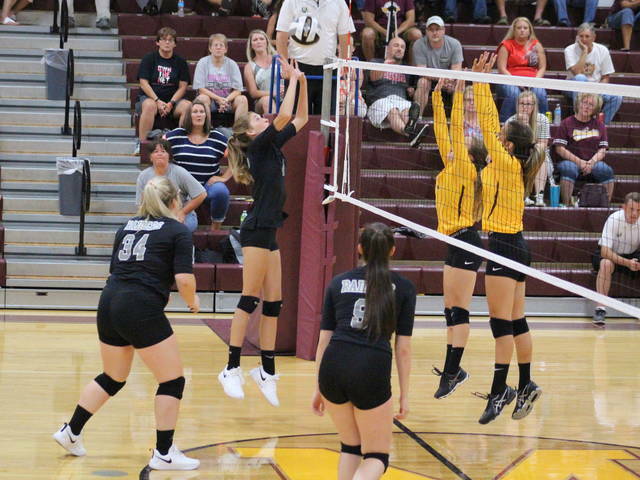 There were seven ties and as many lead changes in getting to 17-all during Game 3, but the Maroon and Gold broke away with five straight points before closing things out with a 3-2 spurt — giving the hosts a 2-1 match advantage. Game 4 was the only time all night that both teams didn’t hold a lead as River Valley broke away from a 1-all tie and twice led by as many as 13 points while evening the match up at two apiece. Both teams traded leads out to a 2-all tie at the start of the decisive fifth game, but the hosts rallied with five consecutive service points from Madison Fields en route to a 7-2 cushion. Following a River Valley timeout, the guests broke serve and made an 8-1 run that resulted in an 11-10 edge. Meigs managed to break serve to knot things up at 11-all, but the guests reeled off the final four points to complete the comeback and sneak away with a 3-2 match decision. In all, the five-game thriller featured 21 ties and 26 lead changes — with the Lady Raiders holding the largest lead of the match in their Game 4 win. Meigs took its largest lead of the match at the end of Game 3. Afterwards, RVHS coach Brent Smith was ecstatic for his troops — mainly in the way they dug in and held their ground when adversity popped up. “Honestly, it’s a special night for these girls. The seniors on this team haven’t been part of too many three-match winning streaks during their careers, more-or-less four,” Smith said. “We knew that Meigs was going to be a tough battle for us, and even when we were down 7-2 in the fifth — I just kept telling the girls to go and take it. Conversely, MHS coach Lee Ann King found Tuesday night’s TVC Ohio opener to be a bit of a disappointment — primarily because of the little things that ultimately cost her squad a chance at victory. Mikenzi Pope and Alexandria Wood paced the River Valley service attack with 16 points apiece, followed by Kasey Birchfield with 11 points. Kelsey Brown and Rachel Horner were next with 10 points each, while Lora Kinney also had eight points for the victors. Brown led the Lady Raider net attack with nine kills and nine blocks, followed by Horner with six kills and Jaden Bradley with four kills. Birchfield added three kills and nine blocks, while Taylor Huck also had three kills. Kinney led the guests with 13 assists and Wood chipped in another 10 assists for the Silver and Black. Fields paced Meigs with 19 service points, followed by Maci Hood and Baylee Tracy with 10 points apiece. Breanna Zirkle was next with eight points, while Marissa Noble and Hannah Durst respectively added six and three points. Savannah Zeigler also had a single point in the setback. Mallory Hawley led the hosts with 12 kills, followed by Noble with 11 kills and Hood with seven kills. Durst also had six kills for the Lady Marauders. Noble had four blocks and Hawley added two blocks. Zirkle came up with a game-high 30 digs, while Fields handed out 19 assists to go along with 22 digs. Both teams return to TVC Ohio action on Thursday as River Valley hosts Wellston and Meigs travels to Nelsonville-York.